With martial law in Mindanao, where next for Duterte? The shocking siege in Marawi City in the Philippines island of Mindanao this past week represents the apex of heightening violence between Islamic militants and counter-terror forces, alongside inevitable strong-arming from President Rodrigo Duterte. The declaration of martial law amid the bloody insurgency has found far more supporters than critics, and raises questions about the immediate future for the archipelago. Renewed efforts to shut down terror operations in the Philippines once and for all have zeroed in particularly on Abu Sayyaf on the resort island of Bohol, as well as across Mindanao, with the manhunt for Isnilon Hapilon serving as the lynchpin in escalations last week. Hapilon, a former leader of both the Moro National Liberation Front, an Islamic separatist group, and the terror group Abu Sayyaf, has long been a fixture on the FBI Most Wanted Terrorists list. He is believed to have become the head of Islamic State operations for the entire Southeast Asia region last year, commanding a dozen or so smaller cells with affiliations to the group. 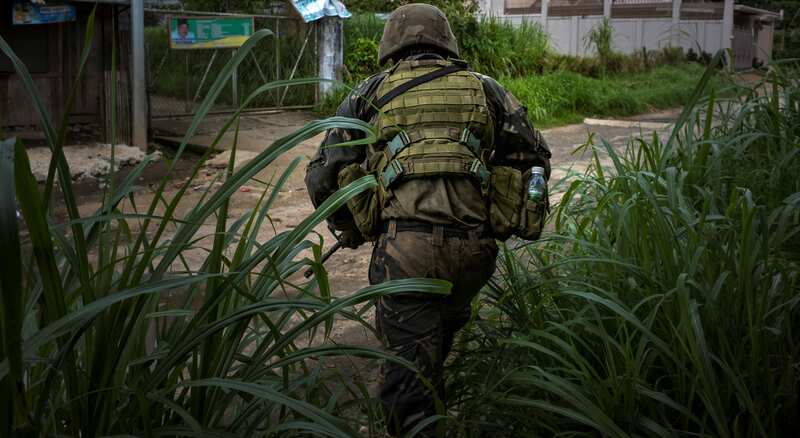 Hapilon has been a prime target for counter-terror operations in the Philippines, with scores of close calls over his decades-long career sending him back into hiding again and again, bruised but not defeated. By Tuesday 23 May, Maute Group forces, brandishing Islamic State flags and weapons, seized Marawi City in direct retaliation for ‘surgical strikes’ targeting it and Abu Sayyaf. Within hours, Maute Group forces had occupied Amai Pakpak Medical Center, freed prisoners at Marawi City Jail and killed around a dozen military and police officers. Social media was flooded with images of black-clad militants charging down empty streets and reports of civilian deaths, prompting the abrupt end to Duterte’s state visit to Russia and the promise of martial law across all of Mindanao. Duterte has previously backed stronger intervention in the region, declaring a ‘state of lawless violence’ following September’s bombing of a night market in his hometown Davao City. ‘It’s not martial law,’ he clarified, but welcomed military and police intervention and called on civilians to comply. Less than a month later, he was tipping martial law across the country, accusing local governments of producing narcotics. ‘Sometimes I am tempted, really, to declare martial law. But it is not feasible, they say, well, fine,’ he said in October. This apparent enthusiasm for the suspension of legal protections has Duterte detractors sceptical the declaration is anything but an exploitation of the current situation to introduce his strongman style of governance (similar to that under which he ran Davao City for decades) to the broader country. Davao City, the largest in Mindanao and now under the leadership of Mayor (and Duterte’s daughter) Sara Duterte-Carpio, has embraced the declaration. Hundreds of young ‘suspicious-looking’ men have been rounded up by police after failing to show identification, with the city’s police chief telling media more than 1000 suspects had obtained fraudulent identification cards amid a lockdown on movement in and out of the city. The ‘hold and secure’ operation in Davao City has seen crime plummet from among the worst rates in the city to an impressive – if questionable – zero reports over 24 hours. Duterte has already suggested the martial law proclamation would be extended north into the Visayas, although leadership in the region has suggested it is not quite necessary. ‘I don’t think so. I hope and I pray that we don’t reach that level,’ Silay City Mayor Mark Golez told local media. Senator Grace Poe, who lost out in last year’s presidential election to Duterte, reflects the broad sentiment among many of the president’s critics which is that martial law is not to be taken lightly and certainly should not be country-wide, but the situation in Mindanao is out of control. During an interview Monday, Poe reminded supporters of the constitutional safeguards against a return to martial law as it was practiced by former dictator Ferdinand Marcos – ‘in our Constitution, you can’t declare martial law just because there’s a threat. There should be rebellion. There should be invasion,’ she said. But in the case of martial law following the attack on Marawi City: ‘I think that we should be able to support it.’ Others are less convinced, with op-ed pages plastered in warnings that an authoritarian Duterte regime is inevitable, particularly when considering the war on drugs already has a death toll double that of the decade-long Marcos martial law-era. Meanwhile, fighting continues in Marawi City, with 90% of locals evacuated and a bizarre partnership between the Moro National Liberation Front and military to fight off what remains of the insurgency. As of yesterday afternoon, official figures put the civilian death toll at 19, government forces deaths at around 20, and Maute Group deaths numbering over 60. Hapilon is reportedly holed up in the city, with his presence ‘strengthening’ the resolve of militants, while ammunitions and reserves run low.